Brain Awareness Week is described by its founding organization, the Dana Foundation, as "the global campaign to increase public awareness of the progress and benefits of brain research". Every year, organizations around the world reach out to their local communities to educate the public and celebrate the brain and brain research. Since 2013, we have participated in Brain Awareness Week by visiting local elementary schools where we do fun and educational activities with students. 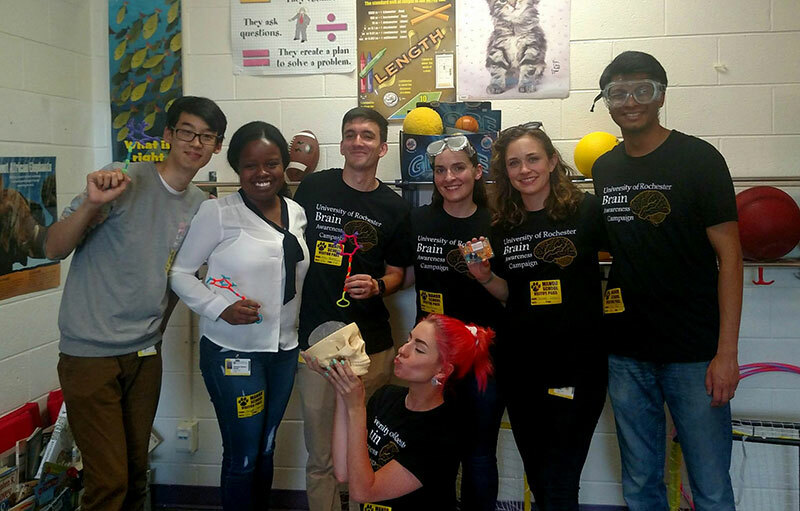 Our volunteers consist of students (undergraduate and graduate) and faculty from the Neuroscience department and the Brain and Cognitive Sciences department at the University of Rochester. In 2017, we worked with 50 volunteers to reach over 400 students at five schools. Our activities are designed to encourage children to think about the importance of their brains and how their brains help them interact with the world. Our topics range from perception and the senses to memory and learning. We have incorporated activities proven to be fun and effective by other organizations, as well as designed many of our own original activities. Educators: If you would like us to attend your school during the next Brain Awareness Week or if you would like to coordinate a separate event with us, please contact us at URBrainAwareness@gmail.com.